Do you love playing in the snow? If so, you’ll want to try this fun Christmas Relay Game with your family! Be sure to dress warm and you may want to wear ski pants to stay dry. This relay game is fun with a large group of people. It’s a great game to play when all of your company is over on Christmas Eve or Christmas Day. You can easily set these games up in your own backyard or at a local park. I’ve also included the game on a free printable so that you can bring it along with you. Split your group into small teams of 3 – 5 people. Each team will work together to complete the challenges listed below. The first team to successfully complete all of the challenges must run through the finish line first. You can create a festive finish line with Christmas garland between 2 shovels stuck in the snow. You’ll want to assign at least one player (who is not assigned to a team) to be a referee. You’ll need a few supplies for this game. Your local dollar store would be a great place to shop for inexpensive game supplies. Build a Snowman: Each team can be given a small bucket of supplies to build their own snowman. This bucket could include items such as a scarf, a carrot nose, black coal or rocks, a hat and a measuring tape. Upon the referee ringing the starting bell, teams must work together to build a snowman of a specified height. When they think they are done the challenge, they have to call over the referee to measure the height of the snowman and get approval to move onto the next challenge in the Christmas Relay Game. 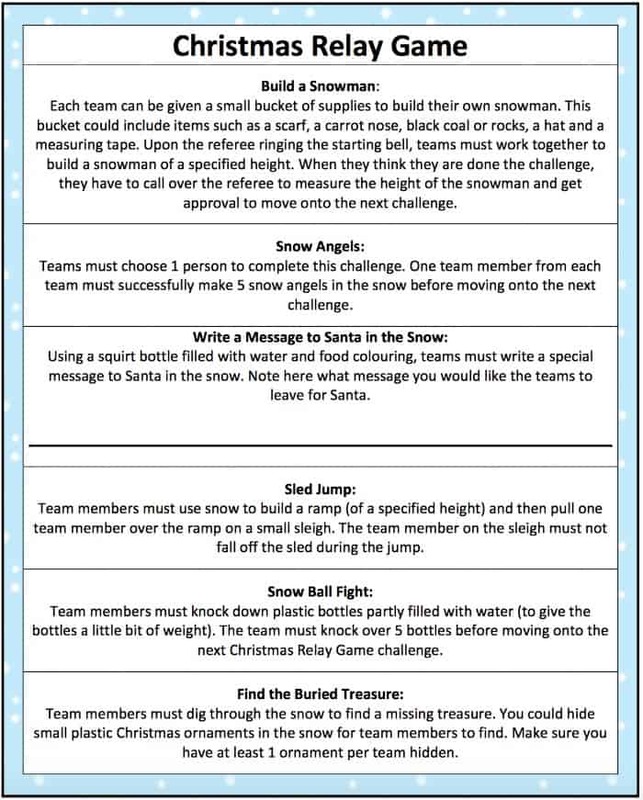 Snow Angels: Teams must choose 1 person to complete this challenge. One team member from each team must successfully make 5 snow angels in the snow before moving onto the next challenge. Write a Message to Santa in the Snow: Using a squirt bottle filled with water and food colouring, teams must write a special message to Santa in the snow. On the free printable Christmas Relay Game, you can write down what message you would like the teams to leave for Santa. Sled Jump: Team members must use snow to build a ramp (of a specified height) and then pull one team member over the ramp on a small sleigh. The team member on the sleigh must not fall off the sled during the jump. Snow Ball Fight: Team members must knock down plastic bottles partly filled with water (to give the bottles a little bit of weight). The team must knock over 5 bottles before moving onto the next Christmas Relay Game challenge. Find the Buried Treasure: Team members must dig through the snow to find a missing treasure. You could hide small plastic Christmas ornaments in the snow for team members to find. Make sure you have at least 1 ornament per team hidden. Which Christmas Relay Game challenge do you think you’d do the best at? What is your favorite outdoor activity? Looking for more fun & free printable Christmas games? 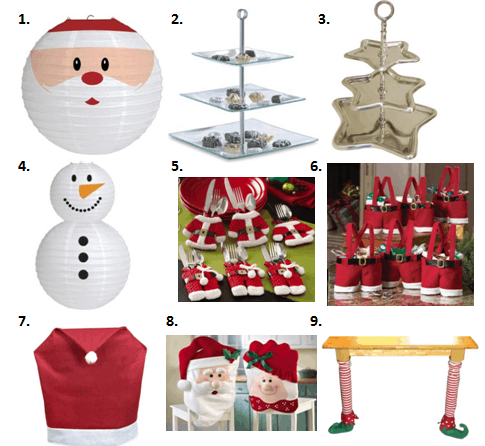 Visit our special Christmas Fun page. Stay updated on the latest ideas for family fun plus freebies by following along on Facebook, Twitter, Pinterest and Bloglovin’. You always come up with great ideas for family fun! Your family is going to have lots of fun this Holiday Season!! Oh these sound like fun! I love getting all bundled up and playing in the snow and my little one is all about building snowmen! This is definitely something I plan to do though once we do get some snow! This looks like a lot of fun! Who would have thought we wouldn’t have snow in Buffalo to do this yet!! Awesome ideas for having fun in the snow, hope we get some soon! Thanks for sharing. Now this is an activity my kids would LOVE LOVE LOVE to play on the holidays! I love this!! This is perfect to do with our family while we clean the kitchen from eating before we dive into presents. Thank you! !